In the wake of the terrorist attacks in Volgograd, voices are growing among Russian politicians to lift the moratorium on capital punishment. Several Russian politicians are demanding a tougher response, following deadly suicide attacks in Volgograd, including a cancellation of the moratorium on the death penalty and total surveillance being among the proposed anti-terrorist measures. 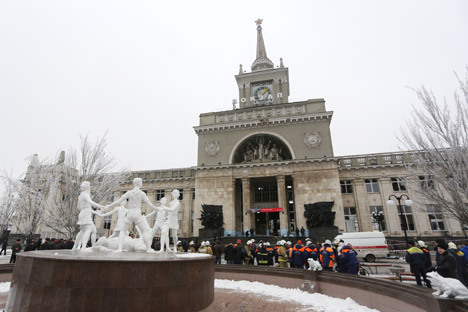 Two consecutive suicide blasts rocked Russia’s southern city of Volgograd on December 29 and 30, taking the lives of over 30 people and injuring dozens more. Nikolay Pligin, United Russia MP and head of the Duma’s Constitutional Law committee, has underlined that the anti-terrorist measures aimed at providing security to the population will fall in line with the country’s law. “No social groups will be discriminated against, no special activities will be carried out against any specific group – all activities will be conducted solely within the constitutional norms and in accordance with existing laws,” he told the Interfax news agency. Pligin believes that the current legislation provides more than enough effective means to combat terrorism and it’s crucial to take maximum advantage of them. However, some MPs have called for the reinstatement of the death penalty. On Monday, Roman Khudyakov from the leftist Liberal Democratic Party (LDPR) introduced in the Duma a relevant draft appeal to the president. “I propose to cancel the moratorium on the death penalty for terrorists, pedophiles, serial killers, drug lords as well as those responsible for serious traffic accidents with multiple casualties,” he told Interfax. Khudyakov says he’s confident that his appeal will be supported by the four factions of the Parliament and get the required 226 votes to be forwarded to Vladimir Putin. “I’m absolutely sure that we won’t cope with this evil by playing democracy and humanity,” Kadyrov wrote on his Instagram page. The return of capital punishment was also supported by United Russia MP, Irina Yarovaya, who heads the Duma Security Committee. However, Pavel Krasheninnikov, chairman of the State Duma's Legislation Committee, said that such an initiative hasn’t been discussed within the United Russia party. “The death penalty is an ineffective punishment for a person who blows himself up,” he stressed. Krasheninnikov said that reinstatement of capital punishment “won’t affect terrorism and other crimes,” suggesting that the law enforcement and security agencies should train more to be able to prevent future attacks. By “high-risk areas” Zhirinovsky was referring to Russia’s North Caucasus and the neighboring Volgograd, Stavropol, Astrakhan and Krasnodar regions. In his interview with RSN radio, the LDPR head said that “total surveillance” of phone calls, emails and other communications in Russia’s south would be an appropriate anti-terrorist measure. The heads of Russia’s law enforcement and security agencies will be summoned to the Parliament this week to explain how they could allow suicide attacks in Volgograd, and discuss legislation amendments to make war on terror more effective.